You’ll Flip Over Our Latest Giveaway…FREE Copies Of Agimat’s FLIP RIDERS! As you may remember, earlier this week, Agimat released their wacky and fun 3D physics-based motorcycle trick racing game, FLIP RIDERS. In fact you can read my full review of the game here. If you haven’t checked out the game yet, or have a buddy or family member who’d like to own copy too, then I have great news for you…we’ve just been given six copies of the game to give away to our lucky readers. How cool is that!? CORRECTION: Agimat’s twitter address is @agmiatcomics (entries with the wrong twitter address are still valid). 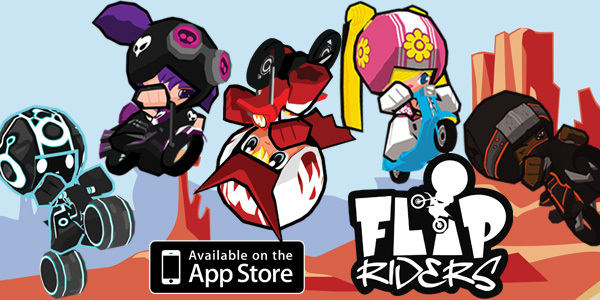 So how can you win a copy of FLIP RIDERS? Each method above will earn you one entry into the contest for the promo codes, regardless of method of entry, you are only eligible to win one promo code per person. Don’t worry, your email address is not visible to anyone but us and will only be used to contact you regarding this contest. The giveaway will run until 11:59 PM EST on Saturday October. 22, 2011. Winners are selected at random using random.org. These promocodes will work worldwide. Congratulations to our six lucky winners, your FLIP RIDERS codes are on the way. Thanks once again to Agimat for sponsoring the giveaway! Make sure you follow Agimat on twitter at @agmiatcomics for all the latest updates regarding the game. ← Whale Trail, Bike Baron & Six More FUNtastic New 99¢ Games Hitting The App Store Tonight!